The Bowman's Best Base Card set will feature 2018's most collectible veterans, rookies, MLB Draft picks and prospects, on chrome technology. - Atomic Refractor: 1 per master box. - Red Refractor: sequentially numbered to 10. All-new insert content will be found in this year’s Bowman’s Best release! Featuring historic retired greats, elite veterans, top prospects and MLB Draft picks who have performed well during their careers, on a recreation of the 1998 Bowman’s Best Performers design. Featuring top prospects who have had an early measure of success in the Minors. Featuring veterans, rookies, prospects and MLB Draft picks who have displayed power acumen during their playing time. A colorful, in-your-face design featuring the best-performing MLB rookie subjects of 2018. - Additionally, look for low-numbered autograph and autograph parallels of Power Producers and Neophyte Sensations! 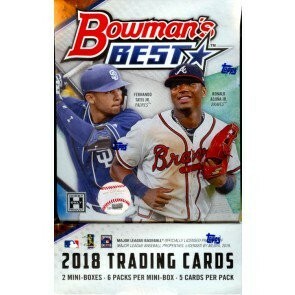 2018 Bowman’s Best Baseball will contain FOUR autograph cards per master box, featuring a checklist including the year’s biggest veterans, rookies, MLB Draft picks and prospects! All Autographs will be ON-CARD signatures! Featuring the top MLB® veterans, rookies, prospects and MLB Draft picks of 2018. - Atomic Refractor: sequentially numbered to 25. Showcasing thematically paired subjects with ON-CARD autographs. Sequentially numbered to 25. - Atomic Refractor: sequentially numbered to 10.